Stunning executive glass workstation. Bow shaped glass desk in a choice of Satin, Black or Curry glass. Signature triangulated legs in Chrome. 12mm thick safety glass. Normal lead time is four weeks from order. 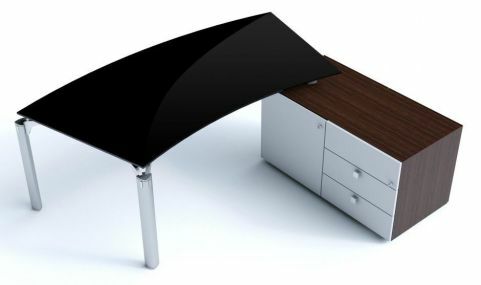 Bow fronted desks are always popular within executive furniture. Not only is it a slight extension of the desk, it also creates an interesting look from a design perspective. These desks not only have this bow fronted feature, but they are also available with a side cupboard attached to further the functionality of the desk. Available for a free UK mainland delivery service within 4 weeks from order.